Work Time Rules help you manage employees' working hours and the required consecutive rest time. They can be found by going to the System Settings and from there you will find a submenu 'Work Time Rules'. 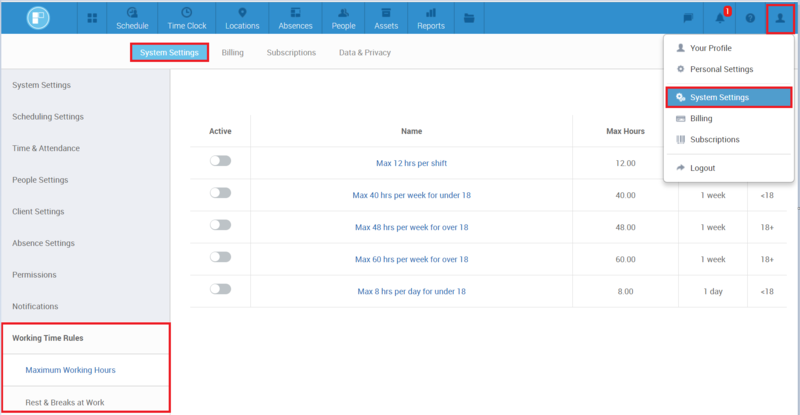 You can set up custom rules by defining the Maximum Hours, Period and Age and if during scheduling any shift is not in compliance with the set rules it will be displayed to you on the Schedule Calendar with a conflict indicator. If you hover over it it will show with which work time rule it is in conflict with. If during the shift adding the work time hours or rest time hours go into conflict with rules that apply to a shift it will be immediately displayed to you so you can amend the shift accordingly. For example, if the shift hours are too long or if the break is too short. Note: In order for the Work Time Rule problems to be indicated on the Schedule you will need to select 'Conflict' under the Tools button. We have put together templates of different work time rules for you which you can either simply activate or edit to suit your company's needs. To add a new rule click on 'Add rule' and a dialogue window will open where you can fill in the details or can also select a template and edit it. Name - The name which you give for the rule will be de displayed on the Schedule page in the problem indicator. Max hours - Set the maximum allowed hours per Shift, Day or Week. Age - Set whether you want the rule to be age specific by entering these to the From and To fields. You can also leave those empty if not relevant to the rule. Opt out allowed - If you switch this option ON the employees will be able to opt out from the rule. The rules that apply to a specific employee are displayed on their profile under the 'Applied Work Time Rule' section. If a person decides to opt out from any of them you can make that rule inactive so it won't be applied to them. The employees are able to see and opt out from the rules on their account under 'My Profile'. The only Work Time Rules that they can see are the ones for which they are able to opt out from. If you would like help with how to create a specific Work or Rest Time Rule just contact our Support via the blue chat bubble and we'll be happy to advise you.